Enhance your World Soccer Championship experience. 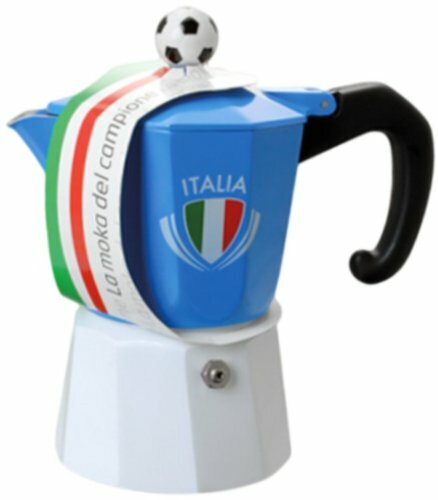 Enjoy the halftime break, or any coffee break, by sipping a real Italian espresso made with this exclusive coffee maker: "La Moka del Campione" (The Champion's Moka), designed by Forever Italia. This classic Italian Moka design has the colors of the Squadra Azzurra, the Italian soccer team. "La Moka del Campione" is created by Forever, the hallmark of stovetop espresso makers. Advanced solutions and a genuine regard for tradition make Forever the perfect choice to transform your coffee experience into an enticing ritual. You can't be a true fan if you haven't bought one yet! Food grade aluminium: Forever stovetop espresso makers are the first in Italy to comply with European health regulations En 601/602. Silicon gasket: Hygienic and easy to clean, perfect and easy lock, remarkably long-lasting. Removable screw-on handle: Easily replaced in case of damage.